MÖNCHENGLADBACH, GERMANY 4 : India edged out England with an aggregate 4-3 margin in penalty shoot-out to clinch bronze medal in the ERGO Hockey Junior Women World Cup here today. India earned their first ever medal in the Junior Hockey World Cup. The regulation 70-minute session ended in a one-all draw. Rani turned out to be star performer for India today as she scored three goals, including one in the stipulated period. Even after five penalties were awarded to each team, the deadlock continued as England and India had scored one-one. In the shoot-out, Rani converted two penalties and 17-year-old Navneen Kaur snatched the match-winner by converting her penalty. For England, Emily Defroand converted her two penalties to reduce the margin for her team. 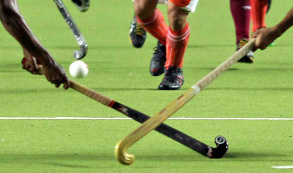 Earlier, England threatened the Indian goal early in the match as they were awarded a penalty corner. However, before any damage could be done by Grace Balsdon, her shot was deflected before reaching Indian goalkeeper Chanu Sanarik Ningombam. English maintained their pressure but it was India which drew the first blood. In a counter-attack Rani found back of the net with a thundering strike in the 13 minutes of play. Few minutes later, India could have doubled the margin from a penalty corner variation. The Indian girls slowly started asserting themselves and changed the ends with a 1-0 advantage. The English girls changed their gear on resumption and restored parity through Anna Toman by shooting on target in a crowded circle. Both teams kept going and went for the winning goal but ran out of time. With a one-all deadlock, the bronze medal match was decided in a penalty shoot-out competition. India replaced their goalkeeper Ningombam by Bigan Soy who has not played a single match earlier in the tournament. Only 5 of 16 attempts were successful in the shoot-out competition with Rani scoring twice and Navneet Kaur scoring for India and Emily Defroand converting twice for England. Indian players Vandana Kataria (20th) and Anupa Barla (23) were shown green cards. Presenqui from Argentina and Aleesha Unka from New Zealand are the umpires of the match. Earlier, Spain eked out a 1-0 victory over Australia in a classification match for the fifth and sixth positions. Guinea Cristina scored the match-winner by converting a penalty corner in the 23th minute. USA beat South Africa by 4-2 for the seventh and eight positions. USA scored through Bolles Marie Elena (15th, FG), Gebhart Laura (33rd, PC), Parsley Nikki (60th, PC) and Bozek Emma (68th, PC). South Africa.